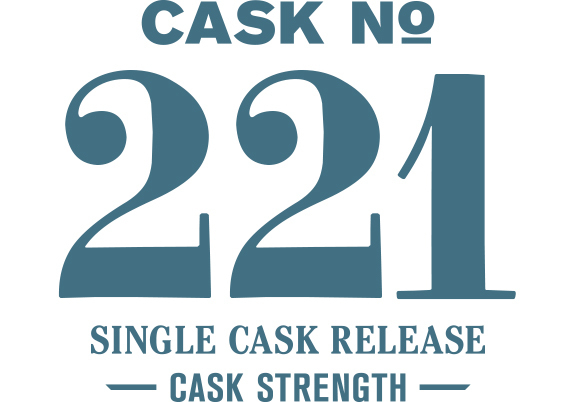 Cask #221 offers a unique opportunity to peer into the future of Westland’s evolving house style. This bottling features one of our two new oak types – this one constructed from 18-month air-dried staves of slow-growth American oak with a now lighter #3 char. It provides the ideal environment for the maturation of our 5-malt new-make spirit. The contributions of the wood are apparent, but after years in the cask so too is the character of the original spirit. We’re left with decidedly grain-forward whiskey that balances the caramel and spice notes of the wood with the nutty and fruity flavors of the malt and yeast. The initial nose brings gingersnap cookies, burnt marshmallow and banana cream pie. The palate reinforces this first impression, with the same marshmallow and gingersnap cookie flavors taking center stage. Water addition changes the nose from gingersnap cookies to snickerdoodle, adds the aroma of an aged dopplebock beer, and marries it with butter and sugar-glazed pecans. Leather surges across the palate first, followed quickly by a spectrum of dark nuts before settling into a continual rotation of leather, pecan and cookies.